Small Island on Lake Titicaca Peru faces Tourism Issues. Amantani is a small remote island on Lake Titicaca, Peru. It can be reached by a four-hour passenger boat ride from Puno. It’s an island facing growth and tourism issues. During my first trip to Amantani in 1997, I fell in love with the place. There were no cars nor roads, virtually no electricity, and only a few dogs, cats, and few horses, and three thousand people which made for a serene place. What struck me then, was the way the islanders worked together to make the community function. Most of that is still true, but unplanned tourism is threatening how the islanders work and live together as a community. Tourism has had an impact, both good and bad. My last visit to Amantani was two weeks ago, which was part, fact finding mission to discover what’s going on, and part reconnaissance for Mountain Spirit Institute’s intercultural experiential education semester programs. Although I had just been there three weeks prior, with a small group of Mountain Spirit students, I returned because I needed to update my perspective about the island. As it turned out, I’d been confronted with some complex issues on the island and I needed time to assimilate what I had learned. During my stay, I covered the whole island on foot, and met with 15 families, 4 community leaders, plus some old friends who I had met over the years. Once back at the port-of-call, Puno, I also met with two established tour agency owners, one who I’ve known since my first visit to Peru. One of the first people I met in ‘97 was Jose Mamani Mamani from the small village of Ocosuyo on the east side of the island. I met him, his wife and daughter while they were turning soil by hand on one of their small plots for growing potatoes. Life was particularly hard for them then. It seemed they were living on the edge. He and others on Amantani practice “dry farming”, which means, they rely completely on the rains of the wet season. A year of low precipitation means tough times with little food. Since 12 years ago however, tourism has helped raise Family Mamani’s standard of living. They are a few of the lucky ones, however. I have stopped by to see Jose and his family a number of times over the past twelve years, and have witnessed the results of large numbers of tourists who file through the small town daily during the height of the season. Life is easier as there are newer clothes, more food, and a new flush toilet. However, just across a small stream, which also serves as the town line, is the village of Ocopampa. Here, David Mamani Calsin tells a different story. He sees about 100-150 tourists disembark daily from the boats at the harbor below, who are then guided to the various families in Ocosuyo. But he and his fellow villagers see no visits at their homes, – nothing more than glimpses of the tourists which are no more than a few hundred meters away. No tourists stay in Ocopampa, nor in the villages of Cancayuni nor Inkasemana. The irony is, Ocosuyo used to be hard pressed as well, to get tourists to their far side of the island. Now they seem disproportionally overrun. Nightly, gringos fill the small town square, playing basketball with locals islanders, who later perform dances and song for the visitors. It seems “Disneyeske”. As I hiked from the island’s main port on the “near side” to stay with my old friend Jose on the east side, I climbed the trail as the sun was low in the late afternoon sky. My first encounter with three of the large groups was on the summit of the Pacha Tata, one of two summits on the island with ceremonial ruins still in use today. As I approached the saddle at sunset I was shocked and dismayed to see three large separate groups of tourists headed for the summit from the island’s far side. Alongside the once quite path, were villagers of all ages, selling sweaters, assorted blankets and tourist goodies. Children approached me to either purchase belts or candies. I had no objection to sharing my experience with other foreigners, nor being approached by vendors, but the sheer numbers from what was obviously one organization, seemed surreal, and the effects were immediate. My heart sank. I thought I’d be writing this article about a slightly different situation on Amantani’s near side regarding my good friend and fellow Mountain Spirit Institute facilitator Richard Cari and family. I first stayed with Richard, and his family when their home was typical of the island, a few bedrooms, a courtyard and common area. Back then, we talked about developing experiential programs, and Richard shared his plans of expanding their home, building a larger hostel, and purchasing their own boat to transport guests from Puno to their island lodge. Through the family’s hard work and Cari’s university education in tourism, and smart business acumen, the family’s dreams have come true, but there have been unintended consequences. Their hostel is no longer a family stay experience, (which means we, at Mountain Spirit, must seek more traditional accommodations for our students). Secondly, the former system of rotating tourist visits with different families by a pre-arranged rotational schedule no longer works as it did. Family Cari, of course, aren’t the only successful family on the island, and aren’t the cause of this shift. Nevertheless, there are some hard feelings among Cari’s neighbors. Richard is a good example of a smart kid whose work has paid off, and he shouldn’t be penalized for being successful. Nevertheless, he and his fellow islanders are at a crossroads. Ted Martens of Sustainable Travel International, responded to my questions and advised me about this situation before my second visit to the island this year. He wrote, “If the goal is to rejuvenate the symbiotic relationship that Cari and his neighbors once shared, he’ll have to share some of the “wealth”. Not necessarily actual cash, but access to his expanded market.” Martens added, “Most savvy business people have a hard time doing this, particularly because it is their hard-earned work that brought the travelers to the island. But, this sort of expansion is not financially sustainable in the long-term”. Martens concluded, “The community betterment will result in the betterment of [Cari’s] business, and sacrificing some business now will bring him greater success in the long term. Community-based tourism fails when the community is not intimately involved at every step”. 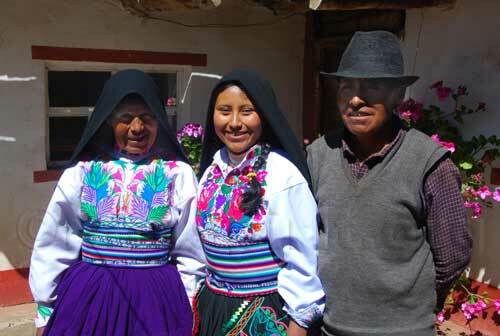 Amantani is a micro-economy, a vivid of example of true community in what was once an almost completely closed system. It has been based on the ancient Andean concept of “Ayni” or reciprocity. Add free market capitalism to the mix, and long-standing arrangements shift – someone working on a neighbor’s home or communal building project may not take the priority as it once did. In the past, islanders have taken their reciprocal obligations as seriously as employment. Now however, labor, materials and capital can be borrowed from a bank in Puno rather than from a fellow islander’s good will. I met with Richard and shared my observations, as well as Ted Marten’s email. Richard said he had indeed already approached other families and offered to share what he had learned in his hospitality training at the university. He reported he had “a few successes”, but mentioned that some families “just wanted the dollar without cleaning their homes or upping their standards of service.” When we discussed some of the hard feelings I’d discovered, he agreed to further reach out to his neighbors. I in turn, agreed that while touring the island, I would mention his good intentions of sharing his knowledge. I had unwittingly written an article, after some absence from Amantani, for Mountain Spirit’s blog that was based on outdated information. This has contributed to the imbalance in the community by increasing traffic to Family Cari’s lodge. Although they appreciate the increase in business, and are good friends, I must encourage tourists visiting Amantani to spread their tourist dollars, and use the traditional system of family rotations for their stay on the island. Richard will understand my stance. He has a brisk business from other international agencies. Tourists will benefit from having a more intimate stay with an island family without encountering other tourists which happens at Cari’s Kantuta Lodge. Mountain Spirit Institute will continue to do some work with Richard and his family, coordinating part of our semester education programs and transportation. Back to the “behemoth discovery” on the island’s east side at Ocosuyou. It turns out a company called Edgar Tours is the wholesaler agency in Puno for these large groups coming to this small village. The more I experienced and learned about the situation, the more I was prepared to dislike this company and its owner. In a meeting with owner Edgar Apaza, I encountered a successful, young entrepreneur. It appeared he had the islander’s best interest in mind. His company has donated time, money and items to the families such as pots, pans, blankets and other household goods. In fact his company has been awarded various awards for tourism. However, even though he has the best intentions, his version of sustainable tourism does not meet best practices standards. When asked why he concentrates such high numbers of tourists in one small remote community, and doesn’t spread the tourist wealth (as well as the burden), thus lessening the impact that concentrated numbers of tourists have on a small community, he replied, “I only deal with the whole village community, not just a few self-appointed representatives who will benefit from the deal.” He added, “When a community is ready to do business as a whole, I’ll bring tourism to them”. When asked about the high concentration of tourists in one area, he said, “Admittedly, we know we need to do something about this. My clients (tour companies such as G.A.P. and Tucan) don’t want to change. They’re in the habit of this routine, and have a good thing going, plus we’ve been a bit slow to address the issue.” To make matters more complicated, he has found himself being undercut not only by competing agencies in Puno, but also by the villagers themselves. Some families are willing to lower their prices by 50% meanwhile other agencies are bargaining for unrealistically low prices. On the plus side, Sr. Edgar is interested in joining Sustainable Travel International and would probably be willing to accept guidance from the association on lessening the impact of his business on this one small village. During my visits with the families and leaders who are not receiving the tourists’ visits, I experienced nothing but goodwill and optimism that “some day, the tourists will come.” I met with Wilber Mamani and Sebastian Yanarico of Sancayuni, with David Mamani of Ocopampa. I also met with two wonderful men, Angel and Florentino, the community leaders of Inkasemana, as well as Flora Mamani of Inka Tiana. All had their homes ready and were waiting for visitors with open arms. So what’s our plan at Mountain Spirit Institute? First, we are educating travelers through articles such as this as well as our blog. Our recommendation is to visit Amantani Island independently and to stay at one of the different, less visited villages on the island. Second, we will encourage the large tour groups to voluntarily limit their group numbers to 12 including guides, and to spread out their impact by visiting other villages and regions on Lake Titicaca. Third, we are promoting a dialogue of sustainable tourism between stakeholders such as local tour agencies, local village leaders and island entrepreneurs like Richard Cari to develop a long-term vision for sustainable tourism on Amantani.Amantani still remains the best home-stay opportunity in Peru, but there are issues that threaten, and already have done damage to the community fabric. This entry was posted on 11/09/2009 at 02:59 and is filed under Conservation, Environment, MSI News, Peru, Sustainable Living/Communities, Sustainable Travel, Traveling, Uncategorized. You can follow any responses to this entry through the RSS 2.0 feed. You can leave a response, or trackback from your own site. Your comments are shared by all of us who visit such places throughout the world. There can truly be a great exchange when we are respectful in how we travel and visit with small communities such as Amantani. The trick is balance. For example, I wrote about one agency that seemed to have overrun the community of Occosuyo on the island’s east side with an invasion of tourists. Did it bring more economic security and a better life for those people? It most certainly gave the families more money in their pocket and food on their plates. David Mamamani Mamamani and his family is a case in point. The tour company did have the villager’s best interests in mind, from their perspective, and when asked, admitted they needed to spread the tourism impact out to other islands, but hadn’t done so yet. # Blend in with the local culture as much a possible by educating yourself of mutual respect while interacting with foreign cultures. # Give back to the communities and countries you visit with some sort of service , education, donations or assisting in some way. # Leave No Trace backcountry, hiking, climbing and camping and homestays in regards to garbage etc..
# Do commerce with local businesses whenever and wherever possible. # Work with local guides, travel agencies, and lodges. # Give of yourself in whatever way suits your style, be it in time talking to a child, teaching them English, learning Quechua prior to your visit, or helping to move some wood if when you aske they accept your offer. # Laugh a lot with your hosts. Looking through your programs I notice you use the Kantuta Lodge. I have tried to contact them but have yet to hear from them. I am also looking into All Ways Travel which appears to run a, shall we say, not as touristy show as Edgar’s. Does All Ways Travel spread the “welath” a bit more? Difficult for me to say which of those two options (Kantuta and All Ways) would be the better choice. Thank you for your article, comments and advice! The best thing? Go down to the dock at 7:AM and buy your tickets at the Amantani Island Boat office, which will be the left office (one of two small buildings) as you enter and step onto the warf. Your boat would then leave shortly after that. This way you can book your boat ticket directly, and start walking once you get to the island, following your nose. That’s what I’d suggest. Kantatuta can be a good first night, but there are many other friendly families just there as well, or further up the hill or the hamlets to the south of the dock. All Ways Travel is very conscientious, in the best meaning of the word. If you would like some names and locations of families I’ve met who would love your company, would be happy to provide. However as mentioned, just heading there is by far the best plan, with the idea of generally which hamlet you’re headed for. Your travel attitude is to be commended! Thanks for taking the time to research this. I was on my morning hike today, here in New Zealand. While on the trail, this post came to mind, and the situation on Amantani. What I recall most is how the situation has so dramatically changed since my first time on Amantani, and the level of industrialized tourism on the island’s east side. We’re currently on New Zealand’s south island in a small town south of Queenstown, where tourism is the main economy, and so is land development, on a big scale. I guess it’s the way of the world, but please solicit local residents directly for lodging, and use your tourism dollars wisely. Vote with your wallet to save cultures and habitat.